PUNE: They are not only eyesores occupying precious space on already crowded city roads. Abandoned vehicles can be a serious environment hazard that needs to be taken seriously. Several of these discarded vehicles still have batteries, tyres, paint and other parts intact. Their decay can mean considerable amount of air or groundwater pollution. “I had reported three such vehicles last June,” said Jaypal Patil, a resident of Kothrud. “I could see a film of oil collecting under one of the cars. One can only imagine the level of damage these cars are doing to the environment,” he added. The damage can be intense and prolonged. “These things are stationary and can produce considerable leachate,” said Nitin Karmalkar, vice-chancellor, Savitribai Phule Pune University and a former head of the department of environmental science at the varsity. 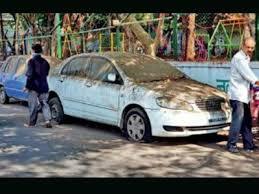 “Abandoned cars have the ability to pollute groundwater. They must be removed as quickly as possible because they make for extremely dangerous pollutants,” he said. The absence of an active recycling system, to take in old cars, has been a long-standing demand of environmentalists. Some fear India’s move to new and cleaner vehicle engines could lead to the abandoning of heavy vehicles running on older, high-emission engines. Mangesh Kashyap, the president of the Society for Environment Education Research and Management, had explained India’s vehicle recycling shortcomings. “The problem of automobile waste is yet to attract attention despite a massive rise in the number of cars nationwide. No formal regulation exists on recyclability and disposal of End of Life Vehicles and there is no infrastructure or an organised system for collecting, dismantling, shredding and processing of automobile scrap. Currently, scrapped vehicles are cut and sold by low-tech units, causing low recycling gains and environment pollution. It is estimated that by 2020, proper recycling procedure and systems can lead to the recovery of over 15 lakh tonnes of steel scrap, 1.80 lakh tonnes of aluminium and 75,000 tonnes each of recoverable plastic and rubber. But nothing is being done to reach such recycling gains,” he said. Tyres are one of the parts that can be recycled. But due to the lack of a proper recycling system, durability of transport rubber and their non-biodegradable nature, tyres take up a lot of space in landfills. Early this month, non-government organisation Chintan released a study showing nearly 60% of end-of-life tyres were likely being dumped or set on fire at landfill sites across India. According to the NGO’s data, the country produced 127.34 million tyres in 2016-17. The 60% of abandoned rubber comes from this number. “Vehicle tyres can be painted and turned around as furniture for open space,” said Sidharth Naik, who is part of a prominent solid waste management group in Pune. “You don’t have to necessarily discard tyres because they are being set on fire for everything - from cooking to fighting mosquitoes. The air pollution caused by the burning should be a concern to the officials,” he added.